Need Context? 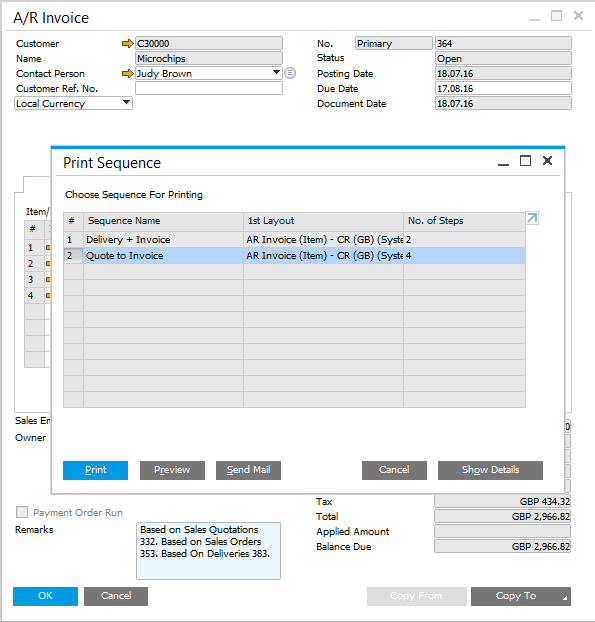 Print Sequence in SAP Business One! History of deals and paper trail are very important and every business uses the relevant reports for keeping track. But what about the vendors and customers? It’s also true for them. SAP Business One enables you to print or send by mail a pre-defined sequence of documents. For example, if the sales process consists of the document chain quotation – sales order – delivery – invoice, you can define the respective sequence and when printing the invoice you can choose to print the entire chain in one click. This way, your customer receives all the documents related to a certain deal and at the same time you can file it all together in your end. Defining a print sequence is done per print layout from within the Report and Layout Manager. You can define multiple sequences per layout, and choose the relevant sequence before printing. In addition, you can preview a sequence of documents and send a sequence by mail. Available in SAP Business One, version for SAP HANA and SAP Business One. For more information please contact Mark Burt at mburt@d1tech.net.